Georgia replaced the Russian ruble on 5 April 1993, with the Kuponi at par. This currency consisted only of banknotes, had no subdivisions and suffered from hyperinflation. Notes were issued in denominations between 1 and 1 million Kuponi, including the somewhat unusual 3, 3000, 30,000 and 150,000 Kuponi. On 2 October 1995, the government of Eduard Shevardnadze replaced the provisional coupon currency with the Lari, at a rate of one million to one. It has remained fairly stable since then. This section contains uncommon Unicode characters. Without proper rendering support, you may see question marks, boxes, or other symbols instead of the intended characters. 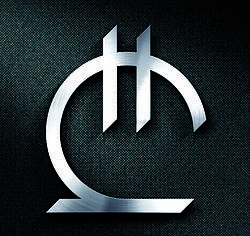 The Georgian Lari currency sign, introduced on 8 July 2014. On 8 July 2014, Giorgi Kadagidze, Governor of the National Bank of Georgia (NBG), introduced the winning proposal for the sign of the national currency to the public and its author. The Georgian lari had its own sign. The NBG announced the Lari sign competition in December 2013. The temporary commission consisted of representatives of NBG, the Budget and Finance Committee of the Parliament of Georgia, the State Council of Heraldry, the Ministry of Culture and Monument Protection of Georgia and the Ministry of Education and Science of Georgia. In choosing the winning sign, the commission gave priority to the samples based on the Georgian Mkhedruli character and made a point of the following criteria: conception, design, accordance with Georgian alphabet, existence of elements marking the currency, ease of construction, and observance of requests and recommendations determined by competition rules. The Lari sign is based on an arched letter ლ (Lasi) of the Georgian script. It is common in international common practice for a currency sign to consist of a letter, crossed by one or two parallel lines. Two parallel lines crossing the letter Lasi are the basic components of the Lari sign. The so-called “leg” of the letter, represented by a horizontal line, is a necessary attribute of the sign, adding monumental stability to the upper dynamic arc. The form of the letter is transformed in order to simplify its perception and implementation as a Lari sign. The author of the winning sign is a professional artist-ceramist, Malkhaz Shvelidze. Coins are issued in denominations of 1, 2, 5, 10, 20 and 50 tetri, as well as 1 and 2 lari. 1.25 mm 1.38 g Stainless steel. The Borjgali (a Georgian symbol of the Sun with seven rotating wings) over the Christian Tree of Life, and the date of mintage, “1993”, with Georgian and English marginal legends on it, “საქართველოს რესპუბლიკა” and “REPUBLIC OF GEORGIA”. The denomination numeral "1" on the upper part of the coin, with the legend “თეთრი” (tetri) and the vine tendril underneath. Smooth. 1993 1993 — The edge of the reverse of the coin is circled with the plant ornament. thickness 6.50 g Copper-nickel. The coat of arms of Georgia, surrounded with a symbolic image of Sun beams, the legends “საქართველო”, and the date of issue “2006” under the coat of arms. The denomination numeral “50”, and the legend “თეთრი” (tetri). Milled. Bears a bilingual legend “საქართველო” and “Georgia”, with five-pointed stars in between. 2006 2006 — The edge of the reverse of the coin is circled with dots. thickness 7.80 g Copper-nickel alloy (silver color) Half-milled. The coat of arms of Georgia, the legend “საქართველო” on the upper left side, and the date of issue “2006” on the lower right side. Half-milled. Denomination numeral “1” and legend “ლარი” (lari). 2006 2006 — Both sides of the coin have a microelement, a lion head (analog of the old Colchian Tetri coin). Ten lari notes are produced by Polish Security Printing Works (Polska Wytwórnia Papierów Wartościowych). ^ When the lari sign isn't available to hand, the letter ლ or ISO code is used. ^ National Bank of Georgia. "Lari banknotes". Retrieved 30 December 2006. ^ "Georgian Lari has its own sign". Retrieved 5 December 2017. ^ a b c d "National Bank Of Georgia". www.nbg.gov.ge. Retrieved 5 December 2017. ^ "Lari proposal" (PDF). Retrieved 5 December 2017. ^ "Announcing The Unicode® Standard, Version 8.0". blog.unicode.org. Retrieved 5 December 2017. ^ Linzmayer, Owen (2012). "Georgia". The Banknote Book. San Francisco, CA: www.BanknoteNews.com. ^ "National Bank Of Georgia". www.nbg.gov.ge. Retrieved 5 December 2017. Wikimedia Commons has media related to Money of Georgia.